Perform facilitated stretching exercises without a partner. 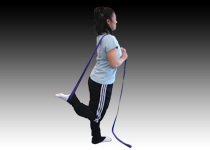 Excellent for single-plane stretches as well as three-dimensional stretches using the spiral -diagonal patterns of PNF. Made in the USA from purple, 1-inch nylon webbing, soft to the touch and easy on the skin. Overall length is 8 feet, with a 12-inch loop at each end. By Robert E. McAtee & Jeff Charland. We’re delighted to process your order for the Hand-L and our other products here. 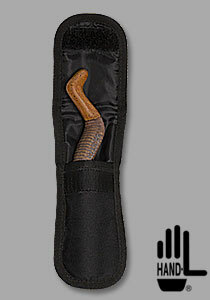 We also encourage you to support our retail partners who carry the Hand-L Massage Tool.